In the past, when I wanted to throw together a quick summer dinner, I’d rely on grilled meat with a packaged, processed barbecue sauce. But this summer, I’ve learned that it’s possible to prepare a homemade barbecue sauce in about the time it takes for Meat-and-Potatoes-Guy to heat up the grill and cook up some pork chops. 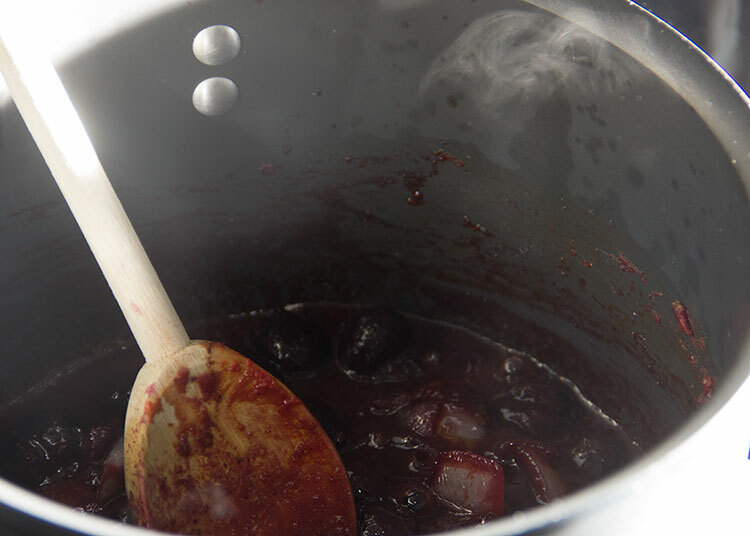 Start to finish, my addictive, slightly sweet, slightly smoky Cherry Barbecue Sauce takes less than 15 minutes to prepare. I love that (unlike the packaged and processed sauce) I know all of the ingredients that go into this homemade sauce (no corn syrup or artificial colors or preservatives are required in the homemade kind!). 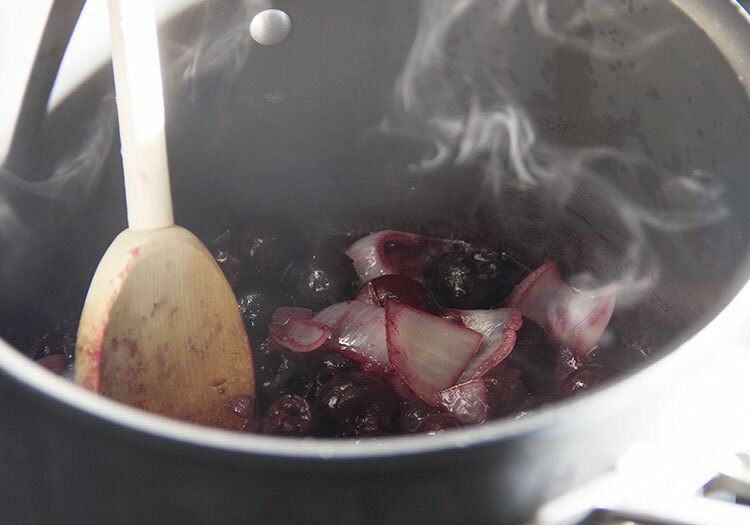 And the sauce is full of healthy whole foods like real onion and garlic and sweet and tart cherries. Plus, Homemade Anything always tastes better. I guess I shouldn’t say always – I’ve had my share of recipe experiments gone very, very wrong. But mostly though, that extra time, labor and love never fails to shine through. Begin by grabbing a small onion and chopping off the root end. Cut the onion in half lengthwise and peel off the skin. 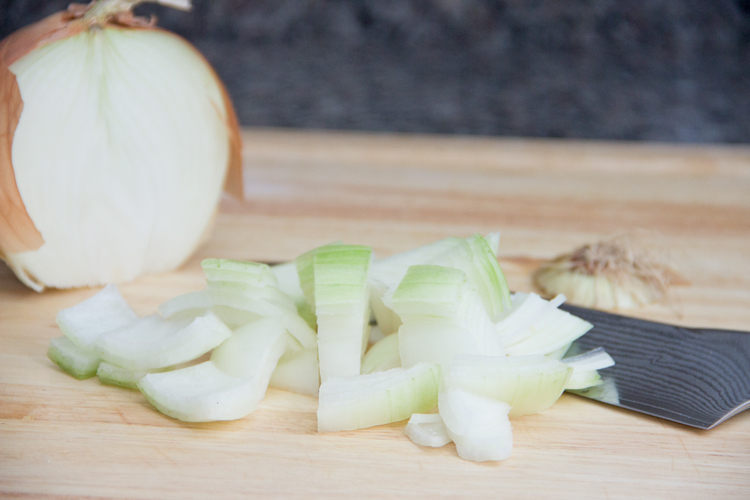 Cut slices of onion lengthwise, then run your knife in the other direction, chopping it up (just a rough chop will do, since the onion will be pureed later). Next, grab a clove of garlic and place your knife flat over it. 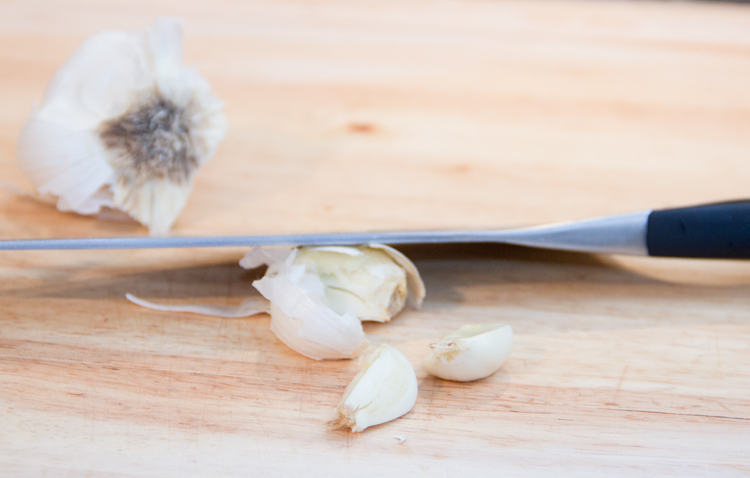 Then press down on your knife with your palm or fist, smashing up the garlic. This makes it easy to peel off the skin (no need to take the time to mince up the garlic clove, it will be pureed in the sauce later). 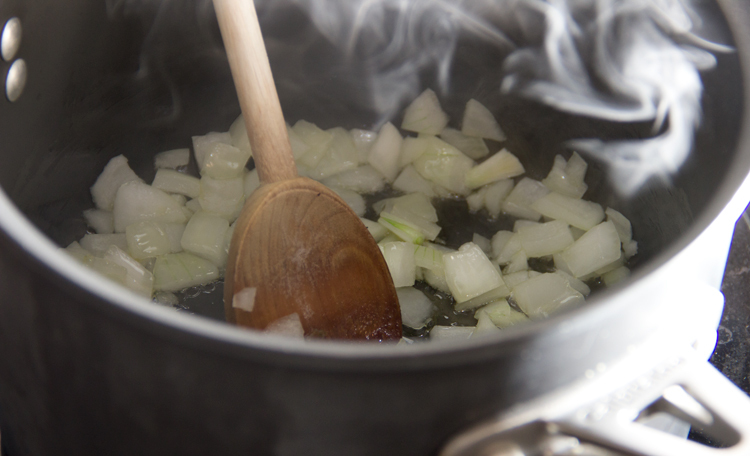 Heat some olive oil in a saucepan over medium heat. Then cook the onion and garlic clove until they’re softened. Add a generous helping of frozen cherries (just thaw them in a the microwave for a minute first), and cook a few minutes more. Unlike the processed and packaged kind (which tends to rely on fructose corn syrup), this barbecue sauce gets a lot of its flavor and sweetness from healthy cherries. Cherries are very high in antioxidants and studies have shown that, because of their high water content, a diet rich in cherries can help improve metabolism and burn fat more effectively. 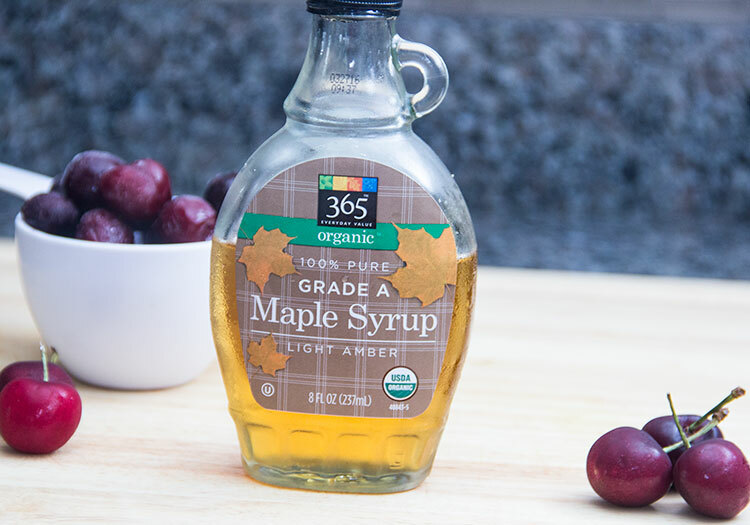 Next, add 100 percent pure maple syrup. Also add some tomato paste, Dijon mustard, white wine vinegar, chili powder and cumin. Stir and allow the sauce to simmer for a few minutes more. Season to your liking with a bit of salt. Then remove the pan from the heat. 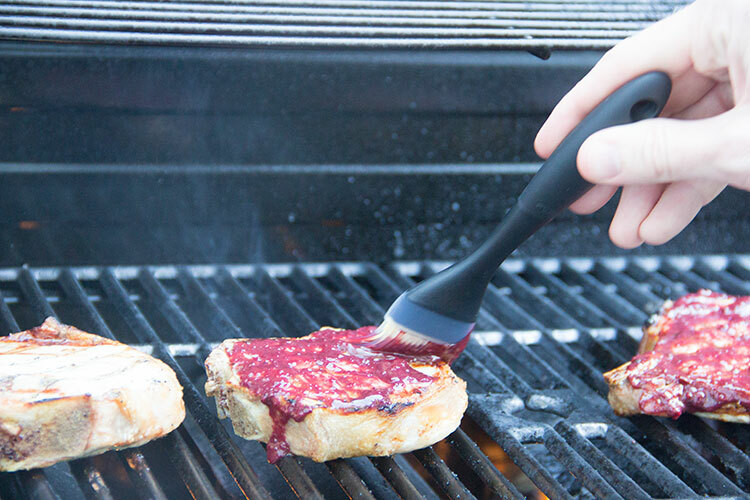 Use an immersion hand blender to puree the sauce. Or transfer the sauce to a blender or food processor to puree. When the sauce is smooth and thick, your work is complete. I like to brush some of the cherry barbecue sauce onto the chicken or pork in the last few minutes of grilling. Then brush on puh-lenty more immediately after the meat is cooked and removed from the grill. 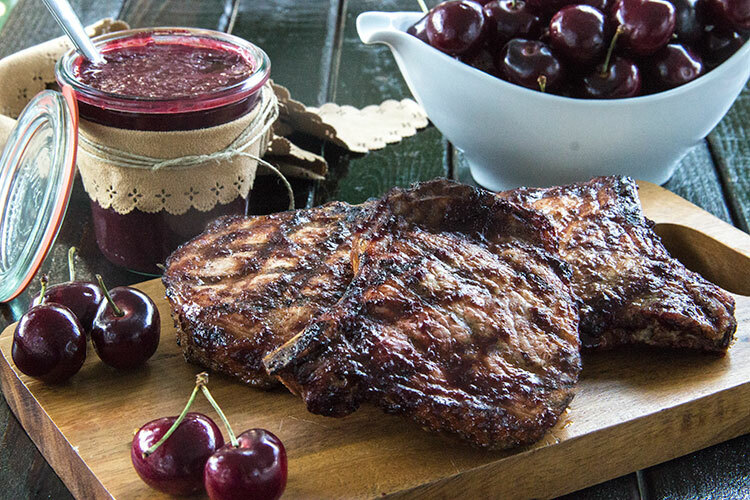 Homemade, flavorful, sweet and tangy Cherry Barbecue Sauce, ready in no time at all. It’s chock full of healthy stuff, so feel free to pile it on! This sauce is tangy and a bit sweet, with a slight kick from the mustard and spices. 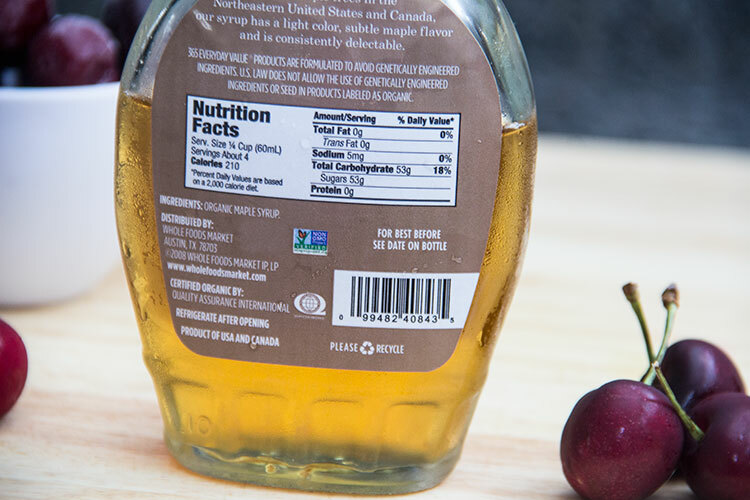 And the distinctive flavor of sweet cherries makes it unique and special. Just 15 minutes to transform dinner from ‘Same-Old’ to something healthier, fresher, more unique, and so must tastier! Brush barbecue sauce over chicken or pork at the end of grilling. After removing the meat from the grill, top with additional sauce. I just did a BBQ sauce post recently. There’s no reason to ever buy barbeque sauce. Yours looks absolutely delicious!!! Why does the recipe call for olive oil, and the instructions say canola oil ? I apologize for my mistake in the recipe instructions, typo has been fixed. 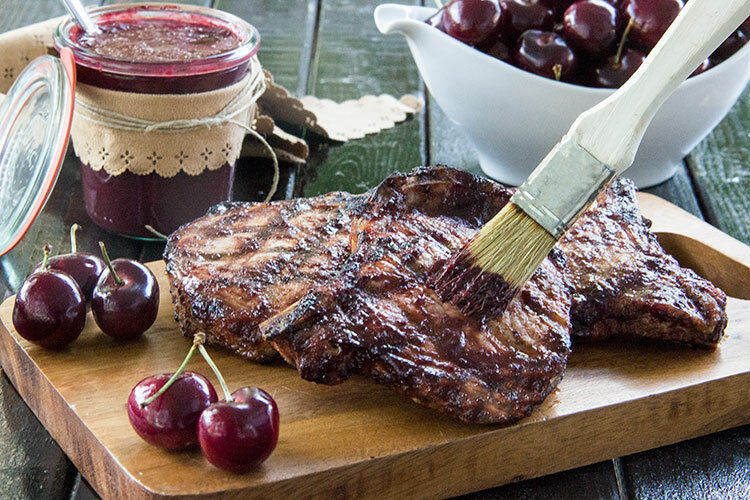 I love cherries, what a tasty BBQ sauce! I love homemade BBQ sauce, especially ones that contain a fruit. This cherry one sounds really delicious! umm.. you had me at 15 minutes 🙂 These sounds amazing on pork! 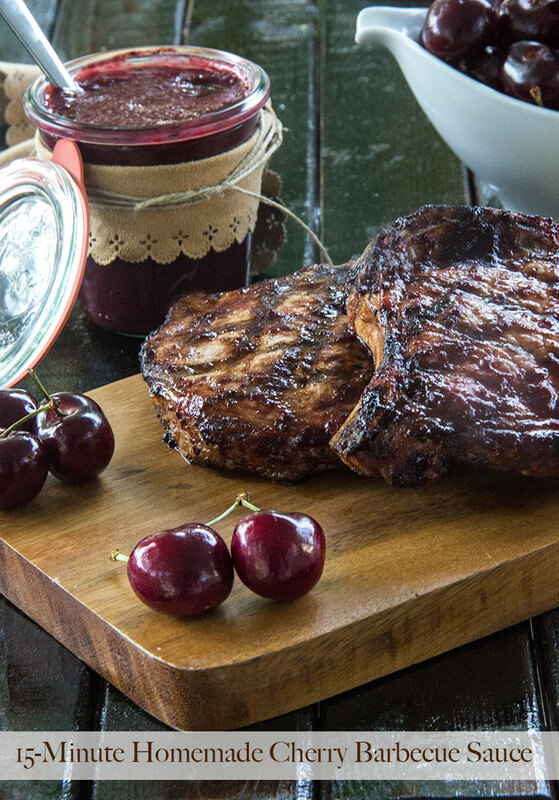 I’m such a bbq girl, definitely trying out a cherry version, yum! 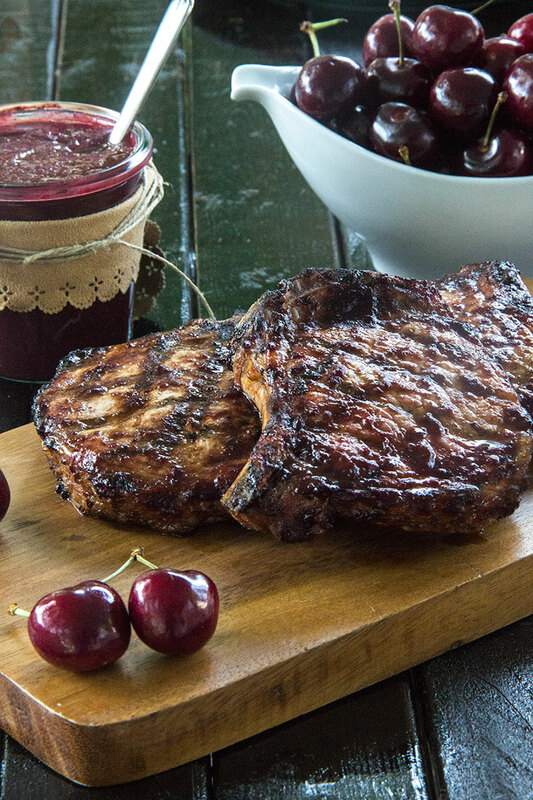 Cherries in a BBQ sauce! That sounds delicious! It looks delicious as well and so easy. Thanks for sharing this. Always looking for quick sauces for the BBQ. Mmmmmmm, sounds wonderful! I may have to incorporate this into our July 4th menu! Can you store this. If so where and how long? Yes, this sauce can be frozen in sealed, airtight containers and, when you’re ready to use, thawed in the fridge.